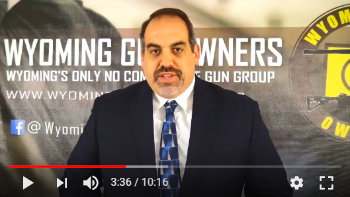 Video Update on Stand-Your-Ground Law! There’s a lot going on in the Stand-Your-Ground law fight. We have a Senate bill, a House bill, upcoming committees and amendments — it’s a lot to keep track of. That’s why I instructed WyGo’s Policy Advisor, Aaron Dorr, to record a video update for you, to help you get the big picture. I don’t know about you, but being able to listen to a message while I’m driving or in the office is very helpful sometimes when I don’t have the time to read an email. As you heard in the video, we are making tremendous progress, but Capitol insiders have made it clear to us that there will be an attempt made to weaken this bill! First, send our PRE-WRITTEN EMAIL to the House Judiciary Committee right away, urging them to back the Salazar Amendment and the full bill in the Committee! Second, please consider coming out to the Judiciary Committee meeting this coming Tuesday, at 12:00pm! We need to show the committee that gun owners in Wyoming care about this bill! Third, please consider an immediate donation to help Wyoming Gun Owners maintain the fight for Stand-Your-Ground law in Cheyenne! You may be tempted to think that passing a gun bill in Wyoming should be easy — but that would be a mistake! The media is opposing us. Weak-kneed ‘allies’ are working behind the scenes to oppose us. Simply put, WyGo is doing all we can to mobilize gun owners in Wyoming with direct mail and email, and we’re trying to roll out a radio ad campaign too! But the costs are adding up. So please make a donation right away, of any amount, to help us maintain the fight in Cheyenne! But whatever you do, make sure you send your email to the House Judiciary Committee right away -– that’s most important! P.S. With a total of 18 legislative days allowed this year in Cheyenne, things are moving fast in the Stand-Your-Ground fight. That’s why I’ve had our volunteer staff assemble this update video, so you have the very latest information! When you’ve finished watching it, please take immediate action using the steps I’ve outlined above! Are You Going to Let Michael Bloomberg Stop Us?